It only takes a short 20-minute bus ride west out of Baden Baden and the world is alright, from the culinary point of view anyway. It was a group of strict believers who completed the pilgrimage to the Old Monastery Guesthouse on the evening of September 20th, 2003 at 9.30 pm. We are not informed as to which Church or Churches these 25 individuals or so belonged to, nor do we know if any were atheists, but we can safely assume that the more conventional church authorities would have had problems with the rather unusual Trinity in which these monotheists all believed: 310, 350 and 560 HP, united behind a propeller. Following a tiring assembly to discuss the personal, financial and strategic future of the brotherhood, the believers had now come to praise their idol – the PA46 – in the form of fuel discussions in the tongues of aviators. And this to be accompanied by more than the traditional bread and wine: With hindsight an immaculate gastronomic experience with perfect service, food, wine and value for money. Comme apéritif: un Pernaud, s’il vous plaît. As an hors-d’œuvre: for example, snails wrapped in pastry with garlic – looking like a spring roll, but not originating in a Chinese kitchen, but in the cuisine française, de la patrie. Main course: Ravioli with seafood and noodles, the ravioli being homemade, of course, about 15 x 15 cm on a bed of the finest seafood. Desert: among other things, Mousse au Chocolat topped with cream and, of course, café noir or espresso. In addition, the finest drinks, though it was noticed that the one or other guest did in fact order an extra sweet white wine with his parfait or a full-bodied red to go with the lamb. Some even ordered a pilsner to quench their thirsts. Parbleu! We pretended not to notice. Nor was this perfect world of sensory palatory pleasures disturbed by the waiters. Whatever the 25 guests ordered was brought discretely and served from the right with charm and an inimitable “bon appétit”. The wine glasses were refilled unnoticed, the wine label always visible, the bottle returned to the ice bucket. Enfin, the bill, l’addition, was placed discretely and correctly on the table without having to be asked twice. Why did we ever let the French keep Königsbruck? Our recommendation: If you have wings to fly, program your GPS with Baden EDSP and, after landing, culinary paradise is just a stone’s throw away. A culinary highlight of a different kind followed on the Saturday: Not a “déjeuner” any more, but a proper German “Brunch”. Not under a slate or thatched roof, but under steel girders. Not on a parquet floor, but on whitewashed concrete. Instead of a fireplace, decorations that look suspiciously like real helicopters. No longer the smell of candles, but motor oil wafting over the white tablecloths. None of which detracted from the quality of the buffet. Excellent salmon in a cream of radish sauce was offered. Or gently smoked trout, spicy cucumber in dill sauce, a delicate prawn salad, tuna with olives and oil like you find in Brittany and fresh bread, just to mention a few of the ingredients of this Italian antipasti platter. And, of course, goulash. There was wine too, but most of the assembled brothers had the regulations of their alternative bible, the LuftPersV, in mind, which forbids the consumption of alcohol within a radius 24 metres around aircraft. A suggestion for the next time: Park the planes further away. The appetiser – less for the senses than for the intellect – more or less easily digestible information about company history, GPS, avionics, JAR-FCL, amazing alternative jet engines – but that all goes without saying. 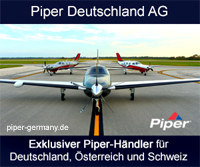 After all, our host, the Motorflug Baden Baden GmbH, newly Piper Service Centre, wanted to make the best possible impression on the believers and potential customers, something which they undoubtedly did. Congratulations on a successful Fly-In and many thanks to Mrs Clarin and Messrs Hardenberg and Greineisen for the hospitality.